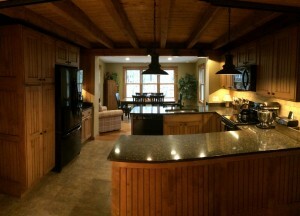 A mantle constructed of douglas fir that was reclaimed from an old granite shed that was taken apart in Barre, VT. The tile is from Trikeenan Tileworks in NH. 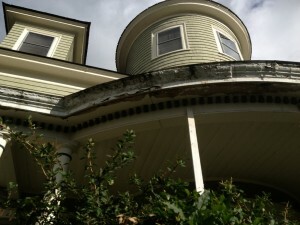 This past week we have been screening in a porch that we built a few years ago. The customer decided that it was more important to keep the blackflies at bay than to have a 100% unobstructed view. We used vertical grain fir for the trim pieces and charcoal screen. To state the obvious, what a disaster. The house is a 3 family rental. It belongs to clients who I have worked for over the years doing small projects to make the apartments nicer for the tenants. Luckily there were no tenants when the flood happened. 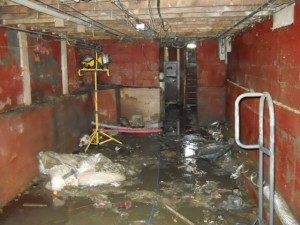 Unluckily we were 2 weeks away from doing a medium sized renovation when the flood happened. When the Winooski overran it's banks the houses on this street were filled with water up to the 1st floor windowsills. The basements were of course full, and in this house the heating oil tanks tipped over and an environmental cleanup was necessary. We filled 5-6 20 yard dumpsters (the big long ones). Luckily the town paid for trash removal. The basement is about 100 feet long and was basically full of stuff. It took weeks just to clean the place out. Then came the power washing and treatment for mold and drying. After all that was over we finally started rebuilding. I am amazed by the fact that it seems that everyone has stayed put. I would have expected more people to just start over somewhere else. Maybe it is the community spirit that kept everyone going. People were handing out free lunches and coffee for weeks. Youth and church groups were everywhere helping out. Thanks to the Mennonites from Morrisville! 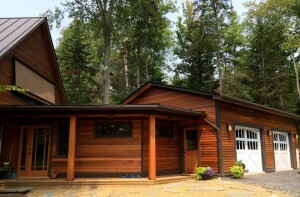 They saved the homeowner thousands of dollars by providing hundreds of hours of labor for free. The customer wanted to add a dishwasher and update the kitchen a bit but did not have the budget to redo the whole kitchen. We came up with a solution for about 1/3 the price. 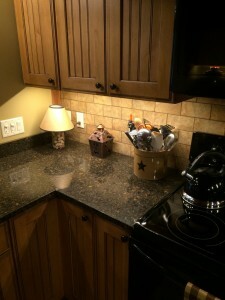 We changed out the sink base and added new Cambria counters. They chose a top mount stainless sink with a shallow bowl because they are tall and don't like to stoop over the sink. They also chose a stainless dishwasher which matches the counters well without clashing with the white stove. We also added a new outlet and updated to GFI outlets and added a tile backsplash. 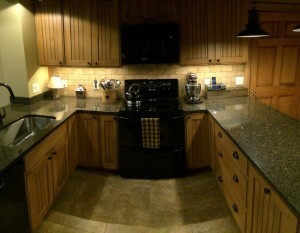 We were able to keep all of the old built in upper cabinets and one of the lower cabinets (with a little alteration). I think it all came together nicely and fits fairly seamlessly. 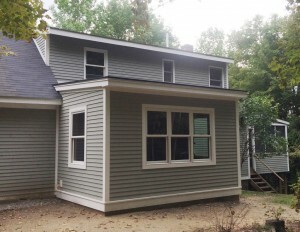 This addition was on a pre-civil war cape. The inspector dated it by the rafters, which were 4x4 timber that was sawn on a vertical blade mill instead of a circular saw mill. The old rafters were 3' on center. Andy reclaimed the rafters to make a bunk bed for his kid. We framed the new roof up with a structural ridge. The eave wall rests on the old 8x8 timber plate. The original bedroom had a small footprint and was built in a kneewall space so it had very tight headroom which required the owners to get out of bed at the end. In addition they had a 5' tall closet that was about 2 feet square. Now they have an additional 80 square feet with 6 feet of headroom. The two new closets are 82" tall, 24" deep and 44" wide.